Mikhail Nekhemievich Tal was born in Riga, Latvia in 1936. 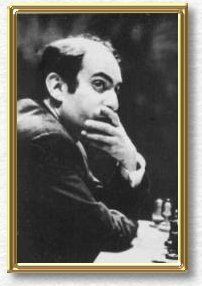 His father was a physician and the young Tal became interested in chess when he saw the game played in his father's waiting room. However, it was not until he was in his teens that he began to study the game seriously. Tal soon became obsessed with the game and played as often as he could. He could even be seen playing a game or two of blitz chess	between rounds at tournaments. For much of his life he suffered from ill-health but his obsession with chess was made apparent when, prior to an operation, he talked about chess until the mask was placed on his face and when recuperating he had to be taken back to hospital on several occasions after making his escape to a local chess club. He defeated Mikhail Botvinnik in 1960 at the age of 24 to become the youngest grandmaster to hold the world	champion title until then. Tal was an attacking genius at the board. His attacks often looked like sheer madness but later analysis would show that his intuition had been correct. Botvinnik is quoted as having said, " I was surprised by his ability to figure out complex variations. Then the way he sets out the game; he was not interested in the objectivity of the position, whether it's better or worse, he only needed room for his pieces. All you do then is figure out variations which are extremely difficult. He was tactically outplaying me and I made	mistakes."